Remember in the movie Julie and Julia when Julie is freaking out that she's going to have to bone a duck? I've always sympathized with that. I like to know where my food comes from and I'm not terribly squeamish about the fact that meat was once part of a living, breathing animal. 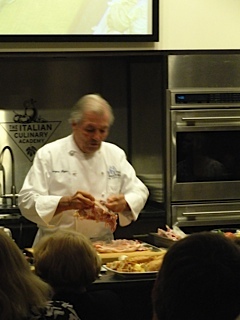 That said, I really don't want to pull a chicken's flesh off its rib cage like "chicken pajamas," as Jacques Pépin described it at a demo I attended for students. Chef Jacques boning a chicken. 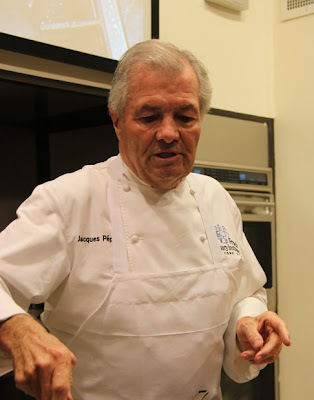 I will admit I was very impressed with Jacques Pépin's skill at boning the chicken. He was so quick—less than two minutes while explaining what he was doing—and made it look so easy; though judging by the incredulous laughter of the culinary students in the audience when he said that it isn't very hard at all, I'm guessing it's not nearly as simple as Chef Jacques made it look. In fact, since the demo I have worked in a restaurant as a pastry chef where the line cooks and sous chef actually had a competition going about who could break down a chicken (which may not be exactly the same thing… honestly I didn't look too closely) fastest; this leads me to believe that I was right in my assumption that it is a difficult task and that Chef Jacques' speed was as impressive as I thought. There was, of course, more to the demo than how to bone a chicken. Chef Jacques was discussing the basics—everything from how to hold a knife to what types of pans you should have in your kitchen, from how to pick asparagus to how to make a flower out of a block of butter (okay, I suppose that last one isn't a basic, but it was amazing!). He talked a lot about produce, including how to break down an artichoke to get to the hearts. 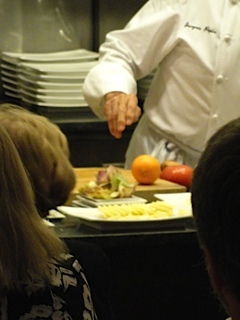 He suggested peeling the broccoli stems to get to the more tender inside and then eat it raw. Interesting fact about asparagus, you should look for the fat stalks with tight buds (the leaf like things at the top of the stalk). I always thought the thin ones were the way to go, a very common mistake, apparently, but the thick ones are apparently more flavorful. If they are too fibrous, you can peel the bottoms a little. He gave some additional tips. Use a non-stick pan to make omelets. You should always clean copper pots with salt and vinegar. Speaking of copper, a copper bowl is the best thing to whip meringues in. And while we are on the topic of meringues, you should always separate eggs using your hands. It's much more reliable than trying to use the two halves of the shell. Overall, the demo was the most informative one I've seen. Honestly, it could have been dull as a box of rocks and I still would have enjoyed myself—just being in the same room as Chef Jacques Pépin was enough to thrill me! Mercedes Wilby is a recent graduate of the Classic Pastry Arts program. On her blog, Pastry Place, she chronicles her culinary exploits at The International Culinary Center, throughout New York City (and occasionally beyond), and in her own kitchen.